For those that don’t already know, New York governor David Paterson has recently signed a bill limiting stop and frisk data from being stored in a vast computerized database. Thankfully, the governor did the right thing. If he chose to do otherwise, then local police would have had the opportunity to tap into the database at will to to help them conduct their criminal investigations. This permanent database of stop and frisk encounters is one of the first places cops would have stopped to look when investigating actual crimes. Many people may wonder where the issue comes in at, well I'll tell you. The issue arises here because many of the people that have been stopped and frisked by New York's finest, have turned out to be not guilty of anything whatsoever. As a result, civil liberties groups and others have come out of the woodwork to passionately protest. Needless to say, this story has generated quite a bit of noise in the streets. Even the governor himself said that, "individuals wrongly accused of a crime should suffer neither stigma nor adverse consequences by virtue of an arrest or criminal accusation not resulting in conviction”. (NY Times Article). So to break down the debate that has ensued, let's start with the advocates of expanding the database. These individuals earnestly support the policy because they adamantly believe that it will undoubtedly promote better criminal investigations and a safer climate within the city. Supporters suggest that attempts to veto the expansion of this database will only prove to hamstring or handicap police officers in their humble attempt to protect and serve the community (do their jobs). Opponents, on the other hand, contend that expansion of the list is a gross violation of civil rights. They vehemently object to adding names to the database because out of nearly three million street stops since 2004, only 6 percent of those stops led to an arrest, and an equal percentage led to summonses. And to add insult to injury, this policy has been reported to disproportionately affect African Americans and Latinos, which has caused some to think the database, in effect, promotes racial profiling. As a matter of fact, New York Times columnist Bob Herbert referred to the expansion of this database as a “racist policy” that needs to stop— and stop now. Moreover, it has been reported that nearly 490,000 blacks and Latinos were stopped by the police on the streets last year, compared with 53,000 whites according to the analysis of the 2009 raw data by the Center for Constitutional Rights. These numbers are staggering. However, the larger point is that expanding this database is unequivocally wrong in my opinion because many of the people that were locked in this database are innocent individuals that were stopped and frisked, but were at the end of the day, found not guilty of anything. So, if the boys (and girls) in blue ended up being totally wrong about so many of their hunches about who to stop and frisk, then I don't see one good reason to keep their names in this database. They were found innocent of any, and all wrongdoing. And to top it off, many of the innocent people on this humongous list just so happen to be disproportionately African American or Latino. Hmmm, can anyone say ‘civil rights violation'??? I sincerely hope that New York’s finest realize that stopping and searching people without good reason or proable cause is unconstitutional. Thankfully, the people have come out to vehemently oppose such an egregious violation of an individuals civil liberties. However, even as we celebrate the progress made in vetoing this bill, we must never forget that, failing to speak up and be heard on any issue of importance can truly lead to unjust policies like the expansion of this computerized database, to slip through the cracks, leaving our civil rights violated. So I admonish you, please do not sit idly by and become a spectator that just watches things go by without having your concerns addressed and acknowldged. Now is not the time to get comfortable, now is the time to reach out to our local officials and keep them accountable for their actions. We owe ourselves that much. What do you think??? PS To voice your concern about this matter and other New York City political issues, feel free to contact Governor David Patterson by visiting his web page: http://www.state.ny.us/governor/contact/index.html. There you will find a variety of ways to contact him and his office. 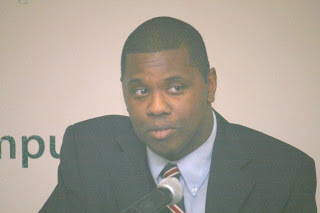 TRENTON--Will Kasso Condry has news for those that think there is nothing going on in Trenton besides crime and gang violence. For those that don't know who Will Kasso, as he is known, allow me to introduce this talented graffiti artist that hails from our state capitol. His work has touched not only this own neighborhood, but has also branched out to people in, for example Philadelphia and Maryland. This mural and its thought-provoking words truly inspired me. At that very moment, I declared to myself that I had to figure out who this artist was and meet him face to face. It turned out he is one of Trenton’s own. Subsequently, I linked up with this gifted artist through Facebook and he then was gracious enough to have a casual sit-down interview with me at the Artworks studio in Trenton. 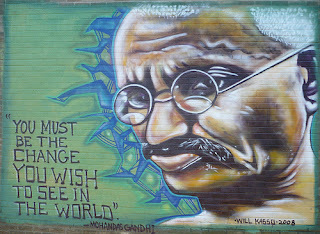 After conversing with Kasso, I realized that the Ghandi mural was neither his first nor his last masterpiece. He and his crew, SAGE Collective, started doing murals many years ago. The vision behind all of their artwork has always remained the same: to revitalize and rebuild the city. As anyone can readily attest, Kasso and his crews' murals have done exactly that by demonstrating a range and versatility. From Bob Marley and Barack Obama to everyday citizens, Kasso and his team creatively blended vibrant images with poetic wordplay. Nowadays, you can find Kasso and the SAGE Collective working together diligently on a large scale 12 mural project called the City of Angels that will be on display in various parts of the city very soon. Heaven knows that Kasso's work is desperately needed in a community like Trenton where poverty is real, opportunity seems scarce and despair looms large. But instead of looking at these stark realities afflicting the Trenton community as insurmountable problems or challenges, this graffiti artist had the audacity to see hope and opportunities to rebuild the city. Instead of taking the easy way out by just complaining or cursing the darkness, Kasso and his crew had the courage to light a candle in a place that many people had written off altogether. After speaking with this inspirational artist, I began to ask myself one fundamental question: How many people, like Kasso and other towering artists before him, actually have what it takes to look at the world they live in a new or altogether different manner? Indeed, we as a community can learn a lot from Kasso’s example. Quite frankly, I believe all too many of waste a lot of energy by complaining and pointing fingers and then become cynical about positive change. The good news is that since we are part of the problem, we can definitely be part of the solution. How you might ask? Well, first I think we ought to put an end to all that finger pointing and start looking at Trenton in a much different way. If we insist on viewing the city in the same manner we have been accustomed to, we will only continue to see the same issues plague our community and in the end, nothing will change. Instead, we must renew our vision of what Trenton could be as Will Kasso and other artists have already done. We must see the city as a place where at-risk young men and women are embraced and acknowledged by supportive networks such as local churches, mosques, and other concerned civic groups, not gangs. We must envision Trenton as a place with better schools, safer streets, and more jobs. We must imagine a community where our parks are clean and the citizens take pride where they live. Having a clear vision is an essential first step on any journey because without it, as the bible says, we as a people perish. However, having a vision alone is not enough, that vision must be reinforced by concrete action on the part of everyday citizens like you and me. The burning question becomes: are you ready to put your hand to the plow and take bold action. And for those that think that taking action is all about grand political gestures, I’ve got news for you, taking action can mean a whole assortment of things on a more everyday level such as volunteering, gathering your neighbors together to do a trash pick up on your block, mentoring a child, and what have you. However, please don’t get me wrong, this journey won’t be easy and results aren’t promised overnight, but if we work together and stay committed, progress is indeed possible. The choice is ours.